Twill binding covers were originally introduced by GBC as a premium option for organizations that were looking for a highly elegant and professional look and feel. Made from paper, they have a very tightly embossed vertical lineal pattern (small lines that run from the top to the bottom of the cover). This pattern gives the sheets a wonderful texture and really helps them to stand out from the crowd. Over time most of the colors of twill have been discontinued, however we still carry white and have some inventory left in a selection of other colors. Check them out below. Welcome to MyBinding video. 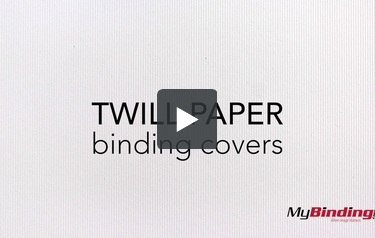 This is Twill Paper Binding Covers. They have a vertical line to texture, giving these card stock-like pages some extra flare. They come in sizes ranging from 5.5" x 8.5" up to 11" x 17". You can choose to add a custom window to your covers or add rounded corners to your oversized coversheets. Even select from 8 punch patterns to receive your pages prepunched. These covers come in an 80lb thickness, which is similar to any card stock paper. For more demos, reviews and how-to's, go to MyBinding.com.